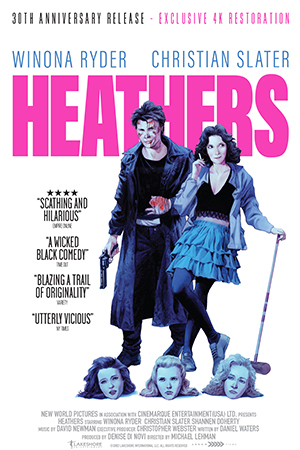 Join us for a special 30th anniversary screening of Heathers! Widely acknowledged as a true cult classic of modern American cinema, Heathers has captured the imaginations of teenagers the world over with its biting satire of the sugar-coated high school movies of the 1980s. At Westerburg High School, an elite clique of snobby girls known as “Heathers” reign supreme. But the smart and popular, Veronica (Winona Ryder) is a reluctant member of the gang, who disapproves of their cruel behaviour. Veronica and her mysterious new boyfriend, J.D. decide to play a trick on the clique leader, Heather Chandler... Together they accidentally poison her, and agree to make it appear a suicide. This sets Veronica on a treacherous path of shocking realisations and explosive confrontations.